Visiting scholar at the Research Training Group KRITIS "Critical Infrastructures: Construction, Functional Crises and Protection in Cities", November 1-30, 2017, and November 26 to December 6, 2018. Four-Day Interdisciplinary Postgraduate Campus in Philadelphia, Pennsylvania, October 22-26, 2017. The Anthropocene is the geologic age in which human industrial activity provides the dominant force shaping the Earth and its environment. As an inquiry, the Anthropocene serves as a fruitful meeting ground for interdisciplinary exploration. Researchers interested in technology, science, and the environment have particularly relevant skills in this regard, taking as they do a highly contextualized and critical view of technological determinism, and with their tools for tracing out material and social trends over long stretches of time. This meeting, building on the success of the Anthropocene Campus meetings in Berlin (2014-2019), will explore the Anthropocene in the setting of Philadelphia and the Delaware Valley. The meeting is timed to precede the annual meeting of the Society for the History of Technology (SHOT) (scheduled in Philadelphia, October 26-29, 2017). The ACP lasts four days. It is built around four main seminars (each participant will choose 2), and includes a fieldwork day exploring Delaware Valley sites. Seminar leaders include leading researchers drawn from across the disciplines and around the globe. Participants will apply for acceptance to the campus: graduate students, humanities/social science faculty at all levels, as well as artists, scientists, engineers, government officials, and other practitioners are encouraged to apply. Themes of exploration include: Writing Global Histories in the Anthropocene; Voice and Representation in the Anthropocene; Slow Disaster; and Environing Technology. Each theme will be explored through seminar meetings, involving guest facilitators and participants in the co-creation of a curriculum. Collaborative writing will lead towards real-time and longer-term publication efforts. A key element will also be local on-site visits, including: abandoned and re-used industrial sites, the waterways of Philadelphia, the Academy of Natural Sciences of Drexel University, and others to be named. Discussion and coordination with non-profit and advocacy groups will also be facilitated. Curriculum Development and interdisciplinary Postgraduate Campus at the Haus der Kulturen der Welt (HKW) in Berlin, November 14-22, 2014. In collaboration with and supported by the Environmental Humanities Laboratory at the Division of History of Science, Technology and Environment, KTH Royal Institute of Technology Stockholm. soil and air at the Anthropocene Campus 2014. Thirty international scholars from the natural, environmental and social sciences, as well as the humanities, art and architecture have been exchanging ideas since autumn 2013 around new content, access, and methods that would do justice to the challenges posed by the Anthropocene. In collaboration with the Max Planck Institute for the History of Science, Berlin, and renowned international partners, the Haus der Kulturen der Welt has developed an Anthropocene Curriculum that explores, in an experimental and exemplary manner, pathways towards a new interdisciplinary culture of knowledge and education. What should a body of "earthbound knowledge" contain, what forms of transmission are appropriate? The Anthropocene Curriculum is an ongoing negotiation across disciplinary lines, taking place as a multistage, online-based process of active knowledge production. The curriculum was tested in the form of an exemplary model course at HKW from November 14 to 22, 2014, open to a group of 100 postgraduates who were selected via an international call for applications. 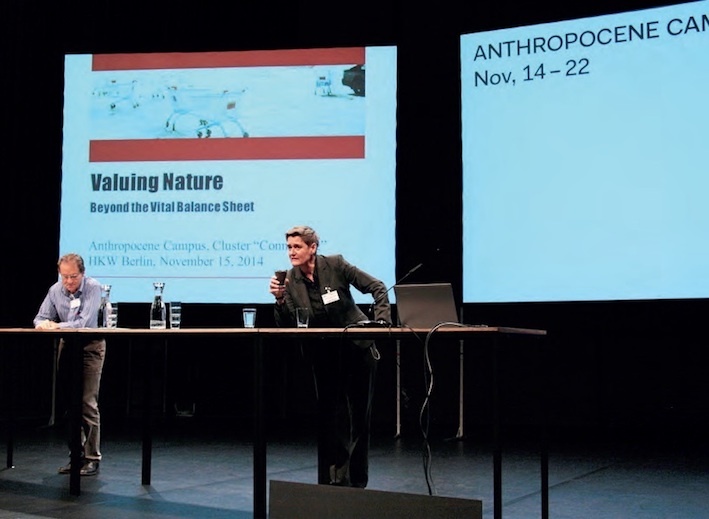 This temporary Anthropocene Campus was accompanied by a program of talks and discussions in which the participating lecturers provided insights into the development of the curriculum. Seminar materials, video and audio recordings of lectures and classes, as well as a coursebook will be made accessible online. Spring School in Science, Technology and Environmental Studies, Abisko Scientific Research Station, Sweden, May 6-11, 2014. Jointly organized by the Graduate Program "Topology of Technology," Darmstadt University of Technology, Germany, and the Division of History of Science, Technology and Environment at KTH Royal Institute of Technology Stockholm. Scientific and technological investigation has always been sensory-based. Natural historians observed and tasted the phenomena that nature produced; experimental philosophers smelled and touched their objects of study; technicians used their ears to diagnose a faulty engine. Throughout the centuries, these professionals developed a multitude of methods and instruments to record their experiences: telescopes and thermometers, scales and seismometers, X-ray and ultrasound sensors. At the same time, they made active use of an array of inscription devices such as ink and paper, engravings and photographs, oscilloscopes and computer screens to visualize their recordings. In science and engineering, as in our culture more generally, the visual sense has continuously gained in importance. The increasing use of GPS and GIS data, as well as the popularity of computer applications such as Google Maps and Google Earth, testifies to this trend. This spring school investigates these processes critically. Although they at first sight may look neutral and objective, instruments and inscriptions always incorporate specific epistemological premises and reproduce a particular interpretation of the world. Recorded findings are intimately connected to power – as are revealed by issues as different as the surveillance of criminals made possible by means of electronic tagging, the creation of consumption profiles by collecting smart-phone user data, and the application of intelligence satellites to track enemy movements. By the same token, processed data have political and economic implications; images and graphs never simply mirror the world in an indifferent manner. Sensory experiences and sensory instruments perceive nature – whether social environments or natural environments – in specific ways, anticipating and encouraging particular forms of understanding, modeling, and planning, while discouraging others. Remote-sensing data from earth-resource satellites, for example, are never innocent. Think about the monitoring of global sea levels, the mapping of deforestation activities, and the search for mineral deposits. The spring school brings together teachers, graduate students, and postdocs working on the relationship between inscriptions and power, between visualized sensorial data and political and economic intervention in social and natural environments. It aims at creating an atmosphere of joint discussion across disciplinary boundaries. "The Stockholm Archipelago Lectures: Quest for the Unity of Knowledge," Stockholm, September 3-19, 2012. David Lowenthal, Professor Emeritus at the Department of Geography, University College London, is widely acclaimed for his writings and lectures on conservation, cultural heritage and its relation to history. Among his many influential works is the seminal book The Past is a Foreign Country (Cambridge, 1985), in which he analyses the multiple and ever-changing roles of the past in shaping our lives. He examines the roots to the modern cult of preservation and pervasive nostalgia and explains why the past remains as potent a force as ever in human affairs. In The Heritage Crusade and the Spoils of History (Cambridge, 1998) he highlights the late 20th century obsession and commercialization of heritage, and its transformation from a small elite preoccupation into a major popular crusade. Graduate Course "Geographies of Heritage: Cultures, Environments, and Conservation in Times of Global Change"
International Graduate Seminar at KTH Royal Institute of Technology Stockholm, September 10-14, 2012. Supported by the Environmental Humanities Laboratory, Division of History of Science, Technology and Environment, KTH, and Tema Q, University of Linköping. In September 2012 KTH Royal Institute of Technology offers a graduate course featuring David Lowenthal. Professor Lowenthal will give a number of public lectures spanning the various subjects covered during his long and successful career, some of which will also serve as the basis for the course. The Swedish STS-meeting took place at the Royal Institute of Technology in Stockholm, May 2-4, 2012. In the tradition of STS meetings in earlier years, the meeting brought together the diverse and dispersed community of STS, to provide room for presenting current research, for exchanging ideas, discussing projects, and networking. Individual papers and entire panels, thematically open, contributed to all STS-related fields, to history, sociology, and philosophy of science, technology, and environment, and provided a broad spectrum of STS-related research in and beyond Sweden. To be as inclusive as possible the meeting was bilingual, with presentations held in Swedish and English. Environmental Humanities for a Concerned Europe (ENHANCE) is a Marie Curie European Innovative Training Network (ITN) providing multidisciplinary doctoral training in Environmental Humanities. The four main partners are the University of Leeds, UK, the Environmental Humanities Laboratory at KTH Royal Institute of Technology, Stockholm, the Rachel Carson Center for Environment and Society at Ludwig Maximilian University, Munich, and the Deutsches Museum, Munich. The main aims of the network are to provide its Early-Stage Researchers (ESRs) – 12 in total across the four participating institutions – with the academic and complementary skills training needed to place them at the forefront of a new generation of Environmental Humanities research; to lay down the foundation for a structured, sustainable approach to doctoral training in Environmental Humanities at EU level; and to provide potential employment for ESRs in a wide range of careers including environmental consultancy, risk assessment, research and development, green business management, sustainable technologies media and communications, and not-for-profit work (environmental and wildlife NGOs). Research and training concentrates on three major areas – natural disasters and cultures of risk, history of science and technology, and environmental ethics – and addresses a series of core interlocking issues: wilderness and conservation; flooding and drought; climate change and risk; and waste, environmental health, and environmental justice. The Berlin Feminist Science Studies Workgroup (BFSSW) was founded in January 2000 at the Max-Planck Institute for the History of Science. The aim was to create a network of scientists from the Max Planck Institute and other Berlin-based institutions or projects working in the field of feminist science studies, but soon the network spread to other towns. Currently the group consists of historians of science, biologists, psychologists, environmental scientists, medical doctors, cultural scientists and philosophers and brings together researchers from different institutional contexts. Research activities have focused on the field of history of medicine, biomedicine, biology, demography, epidemiology, and on related reflections in (feminist) natural science research, (feminist) science studies, post-colonial studies and cultural studies. The broad interdisciplinary composition of the group is reflected in a wide range of methods, theories and practice experiences from humanities, social sciences, natural sciences and medical science. Special issue "Wissenschaftsgeschichte als Geschlechtergeschichte" ("History of Science as Gender History"), NTM. International Journal of History & Ethics of Natural Sciences, Technology & Medicine 14 (2006) 4. Member of the SHOT Kranzberg Dissertation Prize Committee (2019-2021). Member of the SHOT Executive Council (2016-2018). Member of the SHOT Travel Grant Committee (2012-2014).